An attractive anchor Hook for coat hat bag ect. Material: Pine. 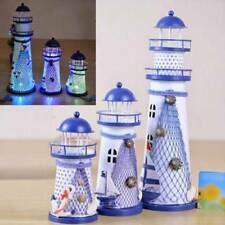 - Decorated with ocean accents, fishing net fish and shells. Hanging Hook Length: 30mmm. - Item can be hung with the hanging rope. - The goods sent are random. 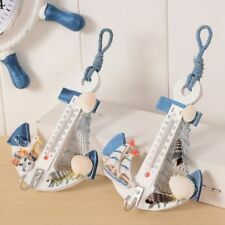 Wood Nautical Anchor Ship Boat Steering Wheel with Fishing Net Home Wall Decor. 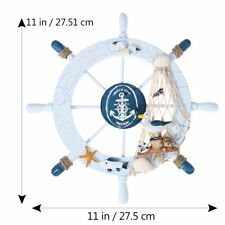 It is ideal for those who love sailing and nautical wall art. And this beach decor will leave your guests in awe. This steering wheel has eight spokes painted light blue and white, surrounding it and is easily mountable to a wall in need of a beach decoration. 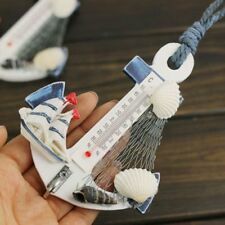 1 Pc x Wood Decoration Anchor. Material: Wood. Use the baking varnish craft, the product surface is smooth, not easy to wear and scratch, good shape effect. vivid and interesting. Material: iron. Wooden Nautical decor Ship Steering wheel 32"
Wooden Nautical decor Ship Steering wheel 32". Condition is used,made by Adams cabinet shop. BRASS DOOR SIGN. MARINE SIGN. FULLY BRASS MADE. EXCELLENT CONDITION. CHECK ALL PICTURES FOR CONDITION. Material: Brass & Wood. Good Piece Of Collection. All Work is Hand Made. Best For Gift. This is a Reproduction Item, Not Sold As Antique. MARINE BOAT DECK LIGHT. Weight of this light is about 0.500 GRAMSo each. There are a total of 2 parts 2 bolt in each. The 240 volt, 2 amp light bulbs are not included. LITTLE & VERY NICE. IMPORTANT NOTE: THIS IS ALUMINUM MADE LIGHT LIKE SILVER. Hand crafted stunning designer Nautical Sextant in Brass with Antique style. This Nautical Sextant would be a great piece for any room & office and a perfect gift for your friend and relatives. This Nautical Sextant made of solid Brass. BRASS DOOR SIGN. MARINE SIGN. FULLY BRASS MADE. CHECK ALL PICTURES FOR CONDITION. EXCELLENT CONDITION. Very accurate and well made reproduction of an antique paperweight. All solid brass, darkened to look old. Certainly easy to wonder its age. MARINE PORT HOLE. PORT WINDOW. SAVE UP TO 20% WHEN YOU BUY MORE. MARINE DECK LIGHT. Weight of this light is about 615 grams each. There are a total of 2 parts 2 bolt in each. The 240 volt, 2 amp light bulbs are not included. LITTLE & VERY NICE. SAVE UP TO 20% WHEN YOU BUY MORE. Nice reproduction of an antique sundial, compass with lid referenced in several antique reference books. TOUGHENED GLASS. MARINE PORT HOLE. PORT WINDOW. FIX TYPE - ALUMINUM BODY. LITTLE AND VERY NICE - WEIGHT APPROX: 800 GRAMS. This small wooden Ship Steering Wheel is made of solid teak wood with a solid brass center hub that has a hole. The ship's steering wheel measures 12" in diameter from handle end to handle end. There is not a better way to enhance your nautical pirate boat decor than with a rugged wooden ship steering wheel inside or outside (this teak ships wheel can weather the elements). 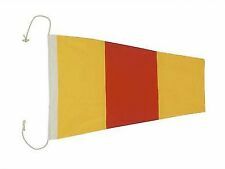 Perfect small size for a kid's pirate boat club house or playground! 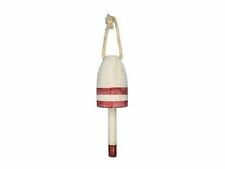 The perfect nautical gift to complement your recipient's nautical furniture decor! Size: 12" inches in diameter, Weight: Approx. 1.35 lbs, Spokes: 6, Material: Solid teak wood, Solid Brass Center Hub,Finish: Natural varnished wood, Made in India. There are a total of 3 brass parts in each. The 240 volt, 2 amp light bulbs are not included. WALL MOUND BRASS PASSAGE LIGHT. BRASS MADE WITH FIBER PART INSTEAD OF GLASS. LITTLE & VERY NICE. WEIGHT: APPROX 800 GRAMS. MARINE BRASS PORT HOLE. PORT WINDOW. FIX TYPE - BRASS BODY. THIS PORT WINDOW IS FOR DECORATION ONLY. BEST QUALITY REPLICA. HEAVY WEIGHT - BRASS BODY. LITTLE AND VERY NICE - WEIGHT APPROX: 2.1 KILO. MARINE BRASS PORT HOLE. PORT WINDOW. BRASS BODY. Made of lightweight polyurethane molding foam, painted and distressed to look like old wood. 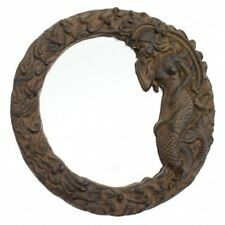 Perfect decoration for a bar, rec room or seafood restaurant. OK for outdoors, too. They are not durable enough to live on the front of a boat. Wonderful new reproduction scrimshaw carved ox bone box. As you can see this piece is tiled with ox bone on wood and decorated with a design typical of the period. Nice felt interior and bottom as you can see in the images. MARINE PORT HOLE. PORT WINDOW. SAVE UP TO 20% WHEN YOU BUY MORE. LITTLE AND VERY NICE - WEIGHT APPROX: 2 KILO. MARINE PORT HOLE. PORT WINDOW. FIX TYPE - ALUMINUM BODY. LITTLE AND VERY NICE - WEIGHT APPROX: 360 GRAMS. SAVE UP TO 20% WHEN YOU BUY MORE. This nautical pocket Sextant is brand new and is very skillfully made. The case measures overall 6" inches in length x 6" width and is 3.25" inches tall. The Sextant is made of solid brass and the case is wood with brass accents. Charming pocket sextant as used by Victorian explorers and surveyors. Intricate and semi-functional, it has all the pieces needed to shoot the sun. A sextant defined latitude. A clock longitude. A beautiful intricate little instrument with an interesting and ancient history. This Sextant is the perfect size for an executive desk. 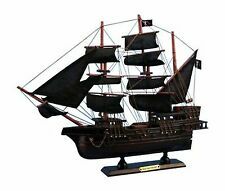 Size: Case is 6" L x 6" W x 3.25" H Material: Solid brass Includes: Wooden display case Free shipping only within the continental 48 U.S. States. 1 x Nautical Decor Wooden Plaque Sign. Hight detailed Handcrafted Wooden Plaque Sign. It also can be added to your collection if you are a wood art devotee. Material: Wood. - Due to the different display and different light, the picture may not reflect the actual color of the item. TOUGHENED GLASS. MARINE PORT HOLE. PORT WINDOW. LITTLE AND VERY NICE - WEIGHT APPROX: 1.1 KILO. New Handmade High Quality Wood and Brass Used. Material : Solid Wood and Brass. Handicraft item not an antique. Significant chip in rim of bottle which is not straight forwardly visible while on display. Faded flag says Georgia. See photos for more condition specifics. Nautical Teak Ships Steering Wheel Brass Hub 30". 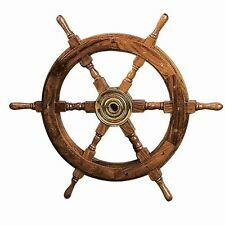 This large wooden Ship Steering Wheel is made of solid teak wood with a brass center hub that has a hole. The Ships Steering Wheel measures 30" in diameter from handle end to handle end. The wheel is shipped with the handles unscrewed to save on shipping. There is not a better way to enhance your nautical marine decor than with a rugged wooden ship steering wheel inside or outside (this teak ships wheel can weather the elements). Size: 30 inches in diameter, Spokes: 6, Material: Solid teak wood, Finish: Natural varnished wood, Made in India. MARINE PORT HOLE. PORT WINDOW. FIX TYPE - ALUMINUM BODY. LITTLE AND VERY NICE - WEIGHT APPROX: 450 GRAMS. SAVE UP TO 20% WHEN YOU BUY MORE.